Year 1 is currently under revision. (View current stage of revisions here) Probable changes may include moving "This Country of Ours" to a later year and using "Our Island Story" by H. E. Marshall and/or "Fifty Famous Stories Retold" by James Baldwin in Year 1 (both of these will be online by the time the revised booklist is finalized). Nature book(s) by Thornton Burgess or Tommy Smith are also being discussed. They will also be available as free online etexts. Changes, including a revised 36-week schedule, will be finalized and posted before the new school-year begins. Asterisks refer to which term the book is used. In order to complete the curriculm, daily or weekly instruction should be provided in the following areas. This site has many versions; it is preferable for a child to become accustomed to the language and flow of the KJV, as a familiarity with King James English will make other literature more accessible. Other books can be read online or borrowed from the library. The booklists, schedules and articles on this website are subject to applicable copyright laws and the terms of this License. The copyright holders provide these materials to the general public free of charge solely through this website. You may use them legally within certain limits. 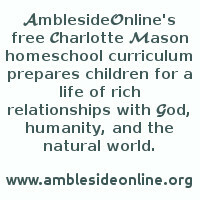 This license is intended to guarantee your freedom to privately share this free curriculum in its pure and original form without charge, to personalize this free curriculum as needed for your own family's private use*, to maintain the integrity of the copyrighted materials, and to insure that the materials remain free for all users. Altering these licensed copyrighted materials is not allowed. You may, of course, adapt the materials for your own private use with your family. You are permitted to privately distribute verbatim copies of this licensed material, printed directly from this website, at no monetary charge. Any distributed copies of this program must include this License Agreement and all copyright notifications, for the legal protection of all concerned. You may not charge a fee for this material. It is free and should remain free.